Some said that the first movie was much better than the second. Others commented that there really was no story line. Let me first start off by saying that I love both movies (for similar and different reasons). I really appreciated the underlying message which is so wonderfully interwoven along side of humor, fabulous clothing, luxury, friendship and the intricacies of life. For those of you that saw the first movie, I don't know about you but the message of friendship really spoke to me. There were many things going on in that movie, but it all came back around to the love, support and friendship of those closest to you. While all of my closest friends live in Toronto, I know they are always there for me-no matter what. I enjoyed how they were each so 'there' for each other as they were in so many of the episodes too. I loved seeing Samantha respond and care for Carrie while she was on her 'honeymoon'. I actually remember crying during that scene (and half a dozen others). I appreciated the writing, acting and overall movie but the friendship that exists there really resonated with me. But enough with the old, let's talk about the new movie-#2! I went into it not expecting anything in particular, just getting together with some of my friends from my lady's group and watching the fabulous four reunite one more time together on the big screen. I'll be honest, it took me about 10 minutes to warm up to it, the characters didn't seem exactly the way I had remembered them until about that time. After that, it was like meeting up with old friends-they were wonderful together and I loved seeing so many of the older characters re-introduced in their own way into the storyline. The fashion is fabulous as expected- oh, the colors and the designs-I really loved them all. Would I wear all of it if I had the money? Probably not but that's fashion, right? While we can't all afford the lovely dresses and Louboutins that the girls sport in the movie, and don't all live in gorgeous NYC apartments or have such amazing connections like they do the underlying story here was real life. Each of them had their own unique circumstances they were working through. Yes, they all overcame challenges in the previous movie (and of course in each episode) but this seemed more real to me, more relatable with where I'm personally at in life. Okay maybe not the part where they live it up in Abu Dhabi, but just life in general. It was nice to see after so many years of their single lives, that even when they had journeyed years ahead that there were still relevant dilemmas, not unlike the ones we all face. Let's face it, some days you can give it all you've got but life can really wear you down. We just need to make the right choices, stay true to ourselves as women, learn from our mistakes and pick ourselves back up. In essence the movie was about owning who you are as a woman, being your own unique self. While one particular character has her own way of responding to life challenges that I cannot particularly relate too, as the character, she stays true to herself. No matter where we live, what our profession is, our marital status or age, we owe it to ourselves to be the best possible version of who we are, and that my friends is what not only the movie symbolized for me, but what I've always wanted this blog to be about. If you've followed the show and the movie until now and haven't yet seen part deux, overall I think you'll enjoy it, you'll be entertained and you'll come out feeling as if this is an appropriate ending. I don't know what more they could have added to the storyline without doing the characters justice. The ending just made sense to me and I don't forsee #3 in the future. One let down for me was seeing how overly-consumeristic the women appeared to be. I think there was a certain level of disrespect shown to the Arabic culture and I think it played to the ignorant and often arrogant attitude that many Americans still tend to have, especially those that haven't traveled enough outside of their own country, to appreciate what so many other cultures have to offer, whether or not their beliefs, attire, culinary tastes or attitudes line up. This is why it's so important to read up on international etiquette before visiting a new country. That was my only real disappointment in this movie. I'm not a fan of crass behavior either and there were a few scenes, that while true to the character, were definitely a bit in-your-face, not unlike the first movie. I'd love to hear which character you most relate to and why. I happen to relate mostly to Charlotte. I share many of her traditional values, am a bit more conservative in nature but know how to have fun too. Like she did, I do dream of having children and a wonderful family. I just adore how she almost always is so polished and perfectly put together. I just wished I looked as adorable as her when I was frustrated, diappointed or put off by someone. LOL. I do have a bit of Miranda in me (the type-A, organized woman with a strong work ethic and a side of sarcasm-just not her cynicism) and a bit of Carrie too (with a love for fashion, design, her dream of finding her true love, possibilities and of course being a 'writer'). While I don't relate to Samantha in any way, she is funny and quite entertaining. Throughout the movie, it was mostly her that had me laughing out loud. If you've watched it already, I'd love to hear what YOUR thoughts were, but for those who haven't seen it yet, try not to add any spoilers. ;) Also, which character do you relate to most and why? I look forward to reading your comments! P.S. The first photo above is of one of my favorite scenes in the movie, something unexpected happens. Oh, and I would love to have a picnic like that! HERE is the official 2.5 minute trailer for those who haven't seen it. Guess what?! I was contacted by CSN Stores again last week. They asked if I would like to host another review or giveaway on my blog. Of course I accepted! I chose to do a review this time around, since I did a giveaway last time. For anyone who doesn't know what CSN Stores is...it is a collection of 200+ online stores-all in one place! They sell everything you'll ever need for your home and beyond. They even sell pet beds, handbags, luggage, shoes, outdoor furniture and more. They really are a one stop shopping source and the best part is you can shop all of their amazing stores with just one cart! 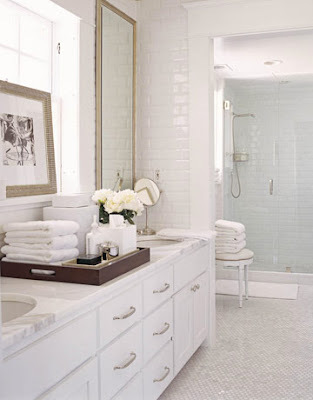 After yesterday's inspiration post, you all know I have been daydreaming about beautiful bathrooms lately. Actually, I spent some time on the CSN website today trying to decide what I would like to review. 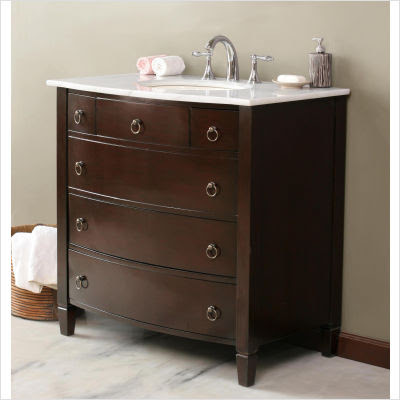 I started with some larger items (you know, bathroom related things that really aren't in the budget right now), and I think this dresser style vanity is just gorgeous! 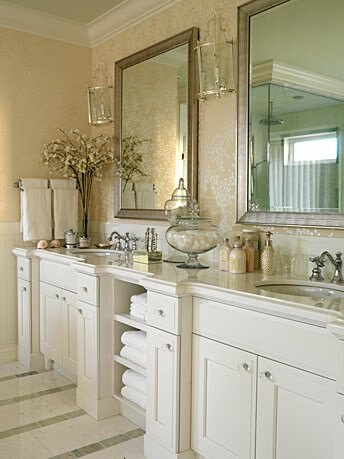 I look forward to having a bathroom vanity like this one day! However, for my review I think I'm going to pick something a little smaller. It really is a hard job to choose an item, with over 200 stores to shop at! I know, poor me. ;) Keep an eye out in the next few weeks for my review from CSN Stores! For those of you that didn't get to participate or see my first giveaway post and might be curious- it was with one of their stores-AllModern.com, click HERE to see the post which includes 17 of their gorgeous accent pillows! Oh, and here's a little something for all of you. These guys must be reading my mind since our bathroom needs a major overhaul. It just so happens that CSN has a contest running called the Green & Clean bathroom bailout. One lucky winner will receive a brand new bathroom from CSN Stores' Room Rescue Crew and Do Your Part that includes $10,000 worth of green products - including a new toilet, tub, faucet, fixtures, flooring, lighting, a vanity, and more! They'll even give you a code for 10% off your next purchase. I find inspiration for blog posts, my books, and creative decor projects in so many great places. I am so grateful to have so many of them available to me in the form of blogs. There is a specific room in our home though that always seems to bring about inspiring ideas: our guest bathroom. This is really no new phenomenon, for my entire life (even as a child) I can remember being inspired in there. Whether I'm blow drying my hair, soaking in the tub or taking a refreshing shower after a sticky FL day, my mind seems to wander to a creative place that I don't seem to experience anywhere else. Recently I was getting ready to meet up with a design client and I almost couldn't leave the house, one idea after the next kept popping into my mind for some future books that I've already begun writing (even though I'm still in the final stages of the first one). I had to keep running into the bedroom and jotting everything down so I wouldn't forget. Eventually I brought the pen and paper into the bathroom with me. I call this my creative flow, it's not everyday that I get a total downpour of creative ideas and I was sad to leave for my appointment because I would have loved to have sat at my desk in front of my laptop and continued writing. Thankfully, I have my notes so hopefully today I can pick up where I left off. Let me also say that my bathroom is not dreamy, so it's not about the decor. LOL. We live in a 50 year old home and have the oh so lovely yellow tub, toilet, sink combo in our guest bathroom (which is also my bath since our master bath is the size of a powder room!). But it doesn't end there, we also have inset accent tiles in yellow too and the baseboard tiles too along with toilet roll holder and built in toothbrush and soap holder on the wall. Our master bath finally has a while toilet and sink and a stand-up shower but has the lovely blue tiles, etc. I hope to replace the sink, tub and toilet but feel like it's a bit of a waste without removing the rest. 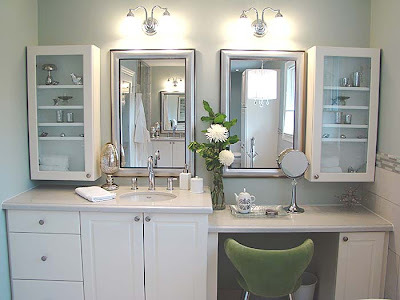 We can't afford to remodel either one (they both need a complete overhaul) so I've worked with the counter top colors and incorporated a serene and spa-like feel as best as I could with paint, framed art, towels, elegant shower curtain and some pretty counter top accessories. We did invest in a new white framed mirror to replace the builder basic one, a new sink faucet, lighting and accessories. With $500 spent it looks a million times better than when I moved into hubby's surfer/beachy themed bathroom. When I browse blogs, watch HGTV or look at pics online, I can't help but dream about what our bathroom would look like if we did remodel. Here are some bathroom pics and soaker tubs that I think are gorgeous, all for different reasons. The colors have me here and I love marble. So peaceful looking, Sarah Richardson never disappoints. Here is another design from Sarah. Traditional, Elegant and so functional. I love this chair in the bathroom and the soaker tub is divine. That stand up shower is huge! Yet another beautiful design by Sarah, she is my favorite designer-creative, bold and incredibly talented. 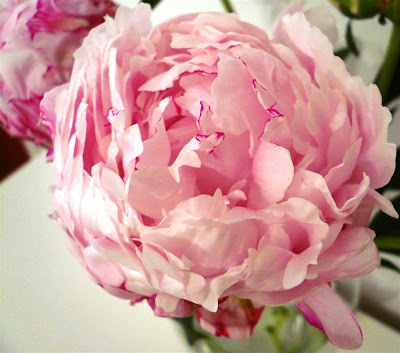 This has such charm and it perfect for a shabby chic cottage. 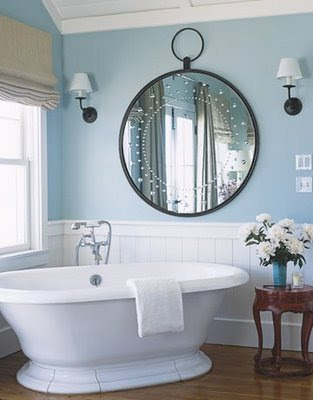 I think what I love the most is the window right at the tub level (on a large, private piece of property of course) as well as the tub and paneling. Photo from My Home Ideas. 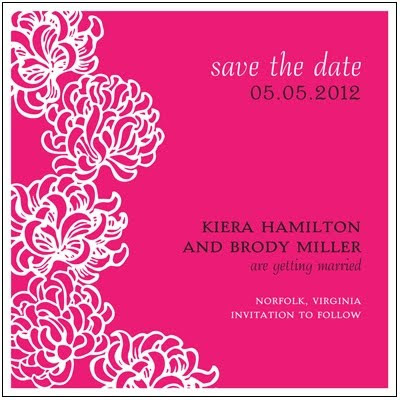 This is a Candice Olson design. I love the clean lines and sparkly glamour. Again with the soaker tub! This one is by Michael Smith (designer for the Obama's new digs). 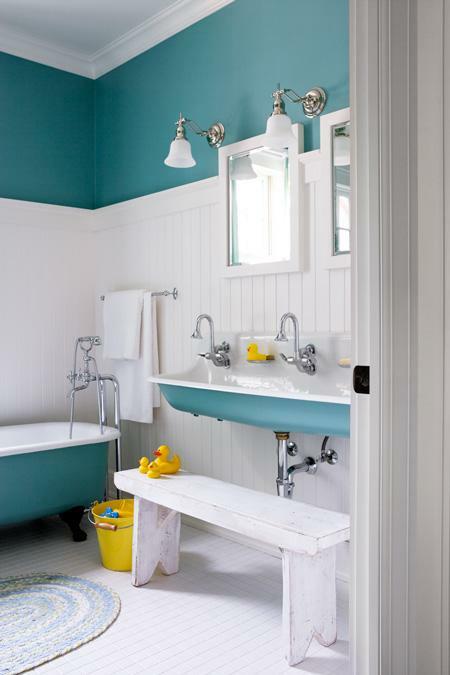 This bath was featured in House Beautiful. I love the color teal, it doesn't exist anywhere in my home but wouldn't this make for a fun children's bathroom? Pic is from Canadian House and Home magazine. 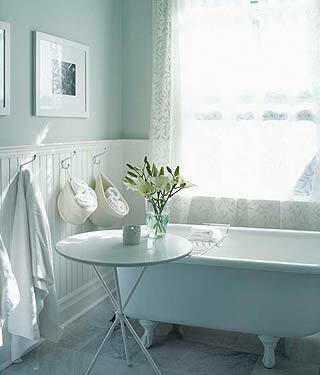 Spa bath from House Beautiful. So clean, crisp and inviting. I love this mirror and vessel sink, the cabinet color is spot on too! Another bathroom by fabulous Sarah Richardson Design. 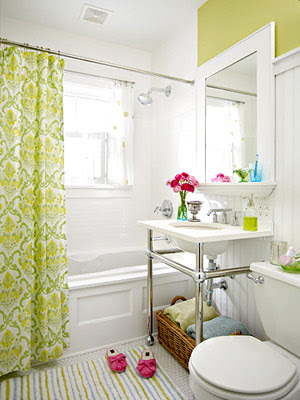 I wouldn't normally go for this green but this would make another great color scheme for a kids bathroom. It's so bright and cheery. I found this on the Better Homes and Gardens site. 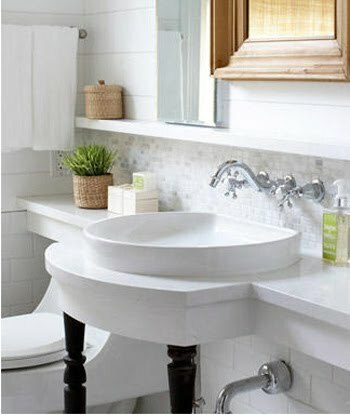 I love the natural elements in this little bath. Simple yet so clean and fresh. Photo from Apartment Therapy. I'm a huge fan of the blog Young House Love. Sherry and John have a knack for transforming rooms. Their home is gorgeous. 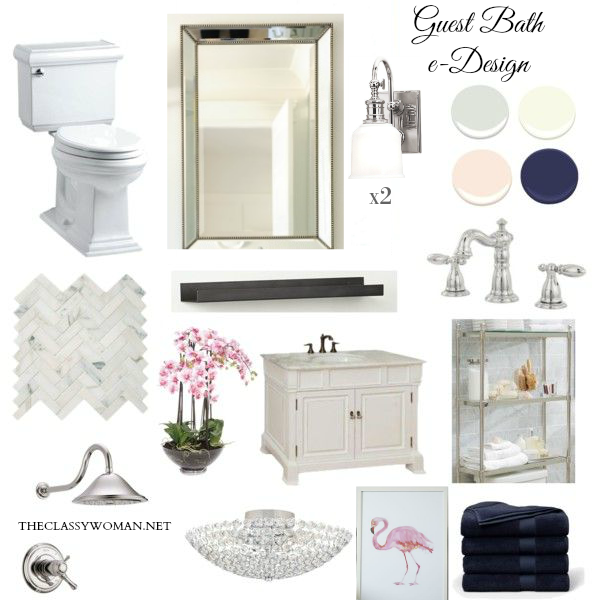 Check out their bath reveal! I love the color scheme and materials they used. 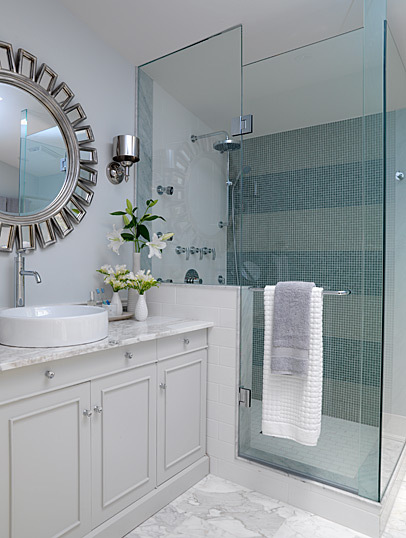 Their powder bath is gorgeous too, I adore the two-tone stripes! I hope to use them in a bedroom some day. :) Do you love their style as much as I do? HERE is their house tour of dramatic before and after photos. 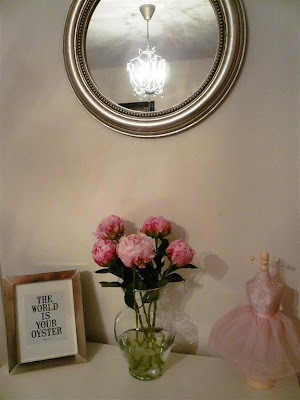 Do you have a special room in your home that seems to evoke creative ideas? Maybe it's a tranquil hammock in your yard? Your comfy and dreamy bedroom? In a poolside lounge chair on your back porch? I'd love to hear about what rooms or other places inspire you! I hope you all had an amazing weekend! Two weeks ago many of you began entering our $50 Stylish Stationery Giveaway from the always generous Pear Tree Greetings. In celebration of Mother's Day, I asked you all to tell me the best advice your mom had ever given you in the form of a comment. I really enjoyed reading every last one of them. With a little help from the Random.org number generator, our lucky winner from the 60 entries that were received (we actually had 61 but the last one was past the deadline, so I had to keep it fair for everyone who had already entered and met the deadline) was Jackie Flaherty of the blog Letters & Journals! Congratulations! You are going to have such a fun time choosing your new stationery. Pear Tree greetings has a lot of amazing designs to choose from. I'm going to show you all what I received from them last week in the next of couple days. So pretty! Jackie, I'll be in touch with you shortly so that we can get that $50 gift certificate into your hands. 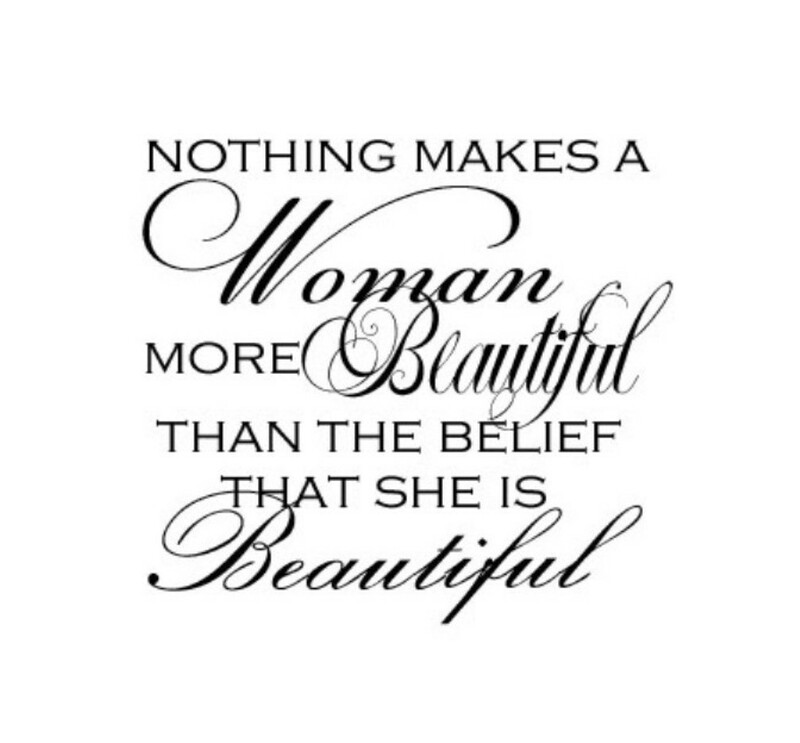 Have a wonderful start to your week ladies! I just wanted to remind everyone that if you haven't entered our fabulous stationery giveaway with Pear Tree Greetings, you still have today and tomorrow to enter, ends 05/22 at 10pm EST. Also, for those of you that have already entered as well as anyone that is new to it today, I'll be providing an extra entry for either today or tomorrow (depending on when you read this). All you need to do is leave a comment with the word 'FREEBIE' on the original giveaway post page HERE (please don't leave it on this post or it won't count). I will be drawing the lucky winner via random.org and announcing it on Monday! Here's to a great weekend ahead! The Little Black Dress: Appropriate for a Wedding? 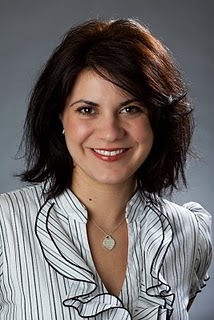 Today I'm excited to introduce you to my first guest blogger Carol Rame. Not only is she a talented wedding planner and blogger, but a longtime friend of mine going back to our elementary school days. We lost touch for a little while but were able to reconnect through facebook over a year ago. 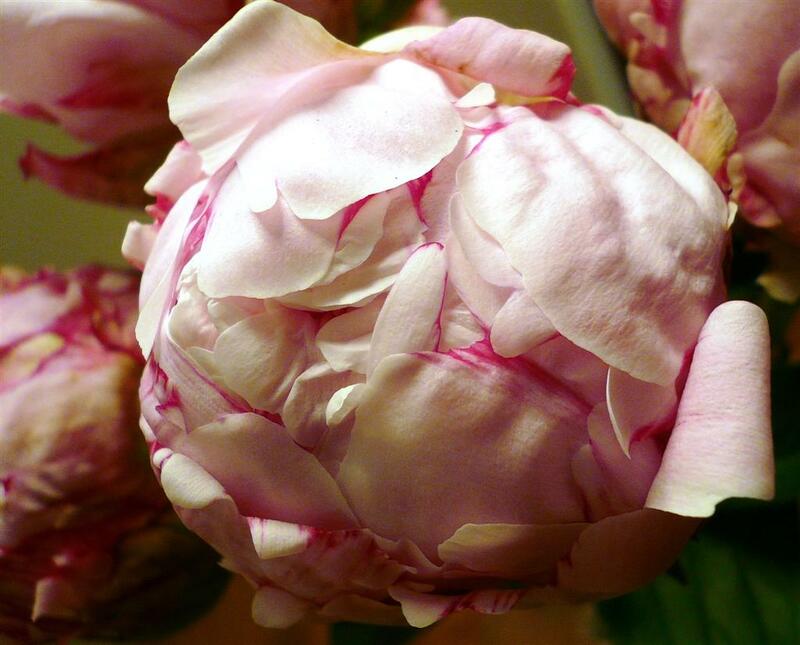 Carol is a Certified Wedding Coordinator and a member of the Wedding Planners Institute of Canada. 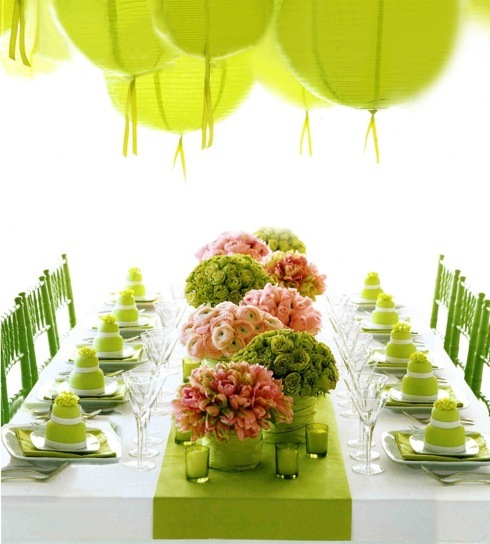 On her blog ‘Noteworthy’ she writes about the ins and outs of planning dream weddings. Her high attention to detail has allowed her to become greatly successful in just one short year. She offers full planning packages including design and decor, and just launched an i-Planning service which allows brides worldwide to consult with her via e-mail to plan their ultimate wedding experience! "I have to ask your professional opinion for a friend of mine...we need you to settle our debate. She wants to wear a dress to her friend's wedding, but it is black. Is it bad etiquette to wear a black dress to a wedding...or is that old fashioned? Please help!" So here goes-the great debate. In many circumstances, black has obtained a bad rap simply because it is seen as the colour to wear when in mourning. It used to be (and still is followed by the majority) that the only colour not to wear was white to a wedding, as only the Bride should be in white on her wedding day. 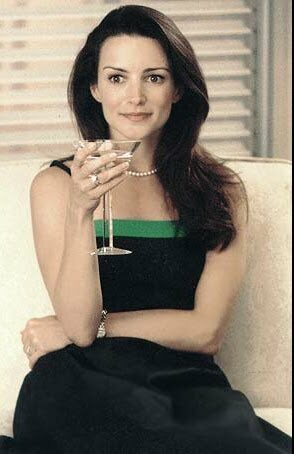 Now I suppose if you were the Mother of the Bride, or Groom, it would cause a bit of a stir, however when in doubt, I would suggest to play it safe and ask the Bride herself how she feels about it. 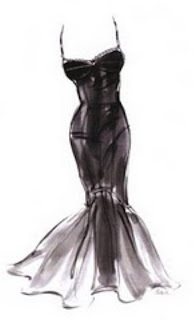 In my own personal opinion however, I tend to view the "little black dress" as being very timeless, chic, and classy, especially for such a formal occasion (think Audrey Hepburn). I do believe that the stigma of "mourning" has worn off quite a bit, and in some cultures white is actually seen as the colour for mourning. I think that as long as the "black tie affair" is around, there will always be black tuxes worn, which naturally look good when paired with the little black dress. Nowadays, there are many couples who are opting for black to be their wedding party colours (which traditionally wasn't done until more recent years). Now what I would recommend is, just because you wear black, doesn't mean you have to go all black-have some fun with it! Dress it up with your accessories! Try wearing a softer colour with it during the day (like white or pale pink, even silver) and swap the look for an evening one later (by going with a bold colour or gold). There are so many ways to dress it up or down with shoes, a fancy clutch, jewellery, scarves, and belts-try it out and add a splash to it! Thank you Carol for being my guest blogger today and for sharing your insight on a question I think many women have wondered at some point. Especially when some women travel from overseas to North America it is important for them to know what to expect since every culture and country is different. HERE is Carol's original post on this topic. Since we are on the topic of the little black dress, and because a few of you have recently e-mailed me with some fashion-related questions, I thought I'd show you a favorite from my own closet. This dress travels well, doesn't wrinkle and I have got so much use out of it. I originally purchased this dress for my cousin's wedding a few years ago. They had both the smaller and larger size but not mine, so I bought the larger size and had it tailored to fit. What are your thoughts on wearing black to a wedding? Do you do it? Are you completely opposed? Leave a comment, we would love to hear from you! Guess what I found today?! I was running some errands and popped into Whole Foods to do an exchange and happened to turn around while I was waiting at the returns desk and I spotted these lovelies. My heart literally skipped a beat and I felt my eyes start to tear up. It was like seeing an old friend. lol. I've been dreaming of peonies and if you read my post titled Pining for Peonies a few weeks ago then you know how much I adore them. 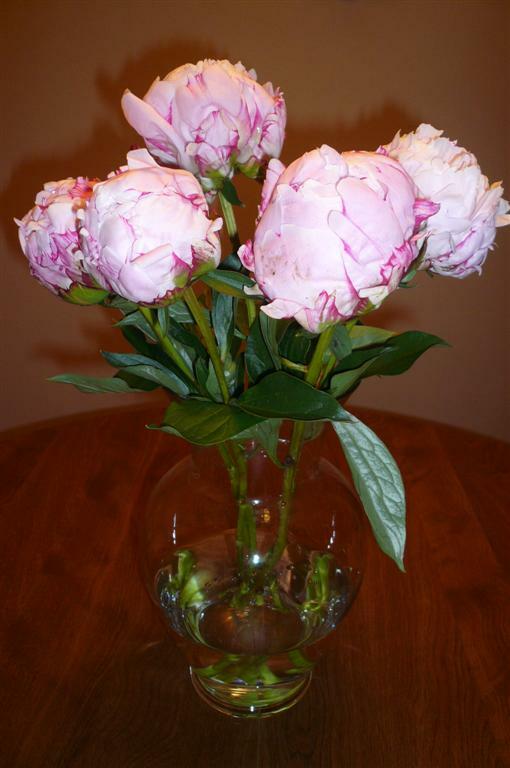 I was so excited and asked the clerk how much they were-just $9.99 for a 5 hearty stems! 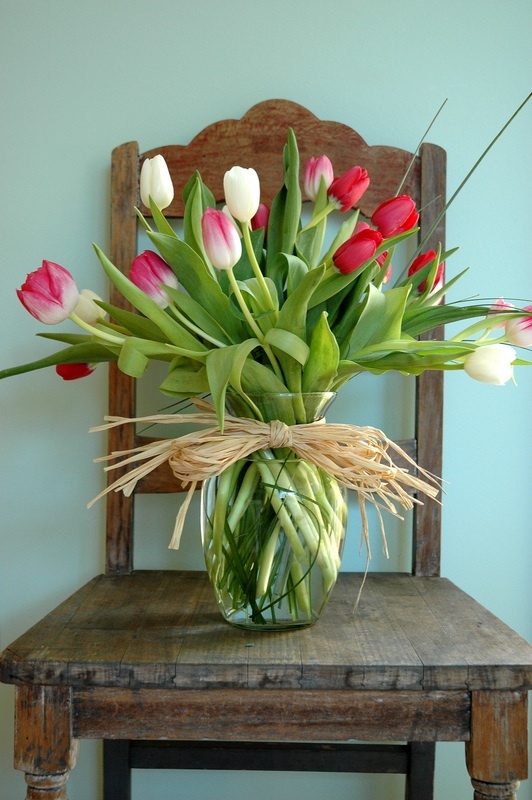 That is a steal compared to the $10 per stem with a minimum $100 order requirement that the florist shop wanted to charge, when I inquired. I kept staring over at them propped up against the passenger seat all the way home and couldn't wait to pull the plastic off, snip the stems, remove some excess leaves and get them into a vase. Since this opportunity doesn't come around often here, I couldn't help but start snapping photos of each individual bloom and the arrangement in the vase. They started out here on the kitchen table. I love that little framed art which reads "The World is Your Oyster" which I made a few months ago. I really do feel like it is at this moment. I'm so excited that my week has started off so wonderful. Lots of good things are happening, I had another great sponsor contact me today for a fun, new giveaway and I can't wait to share the details with you in June. 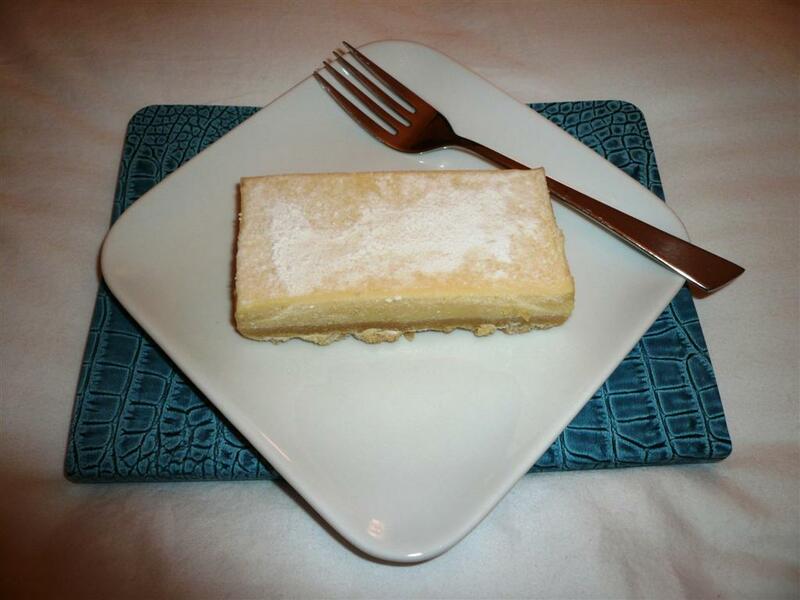 Oh, and I also picked up another one of my favorite things at Whole Foods-their amazing lemon bars. This is what I ate for dessert tonight and enjoyed every last bite. It's amazing how the little things truly are the greatest gifts and can be the sweetest of surprises. I hope you all had a wonderful start to your week too! I know what you're probably thinking, this post has an odd title. But the truth is it's perfectly fitting. Sometimes in life we can be so focused on where we're going, what we're doing and what we need to accomplish in a day that we can completely miss out on the very blessings that are being presented to us. This very thing happened to my hubby and I this past weekend. Paul has a friend that he has kept in touch with but hasn't seen for the past 20 years. I've never met him or his wife, but I've seen photos of them, received Christmas cards and heard a bit about them from time to time. My hubby stays connected via facebook and phonecalls with them since they call California home. I'm going to come back to them, but let me first explain how yesterday unfolded. Yesterday we had planned to meet up with a couple and some other friends of my husband's that he hasn't seen in 3 yrs. The one couple in particular who arranged it were visiting from England. I was excited to meet everyone and enjoy a day in the sunshine. Once we were set up in the park though it was very sticky and the heat had pretty much eliminated my interest in food and had given me a headache. I started to fatigue pretty quickly after a very long and emotionally draining week but pushed through since I wanted Paul to make the most of his visit with his friends. We stayed for several hours and then hubby was ready to pack it in and head home. The drive to and from the park was an hour each way and we had had a lot of late nights during the past week so we were ready to unpack our stuff, unwind with a good book and just relax for the rest of the late afternoon an evening. This past week was filled with a lot of usual stuff but I had also received some not-so-great news that occupied my thoughts and had me in tears a couple days this week. At this point my body was just emotionally spent. We relaxed in our comfy clothes for about an hour, I folded some laundry and planned to go to bed early. All of sudden there was a knock at the door. I looked out the kitchen window and saw a car was parked at the end of our driveway that I didn't recognize, nor did I fully recognize the man who was at our door. I ignored it since I wasn't sure who it was and told Paul (who was so engrossed in his book that he wasn't wanting to answer it either). Paul said he felt like he was being nudged to answer the door so he walked over to see who it was. It was his friend 'R' from California! It did look like him a little bit based on his photos, but I wondered how that would be possible since they didn't live close by. I just had dismissed that thought and assumed it was a salesperson. Paul went outside first and chatted with them and met his wife and young daughter for the first time. It turns out that they has just moved to the Orlando area 2 weeks ago and wanted to surprise Paul! I wasn't really in the mood to socialize to be completely honest. You see, I have a little pet peeve. I am not a fan of visitors that drop by uninvited and unannounced. Terrible, I know. I really want to feel differently and I love other fun surprises in life but somehow drop-ins are never a fun experience for me and Paul is actually not a fan either. There is a reason why it was an entire skit on Seinfeld. Paul's parents are notorious for doing this (usually when we've just come home from a long trip and partially unpacked suitcases are still out) and they think it's funny and don't understand why we don't love it, he's actually had to talk to them about it. I was glad that he wasn't trying to invite everyone inside. I changed my clothes and went outside to meet everyone. We discussed going out for dinner together. I still wasn't really feeling hungry at that point but I did go along so that we could all chat and the guys could catch up in person after so many years. I guess you could say it's was Paul's weekend to catch up with long distance friends. You know what? I'm SO glad we did! They are such a sweet couple, their daughter is adorable and R's wife 'J' and I really hit it off. I can't wait to spend more time with her. It isn't everyday that I meet a new woman who is easy to talk to, fun, has similar interests to me and has a heart of gold. She could really turn into a great friend. I know how frustrating it can be moving to a new city (or in my case, Country) and not having any friends or many people to show you around and where to go, etc. So, we've already talked about getting together very soon which she was excited about. The funny thing is I have been praying for some sweet, new female friends that also love God for the past few months. Slowly, they are being revealed to me including 'J' as well as some of you via the blogging world. It turns out that Paul and 'R' were meant to meet at this time too. They actually wound up discussing an interesting and lucrative business opportunity that they would work on together here in Orlando and all of the little details seem to be lining up in terms of their interests, skills, abilities, contacts, resources-something that neither one of them had expected or ever discussed before until last night. The visit started as an 'inconvenient' time when both Paul and I really wanted to follow our own plan for the evening, but someone had a bigger plan for us, a blessing, that if we were only open enough to receive it, we would and did. It's made me rethink how I manage my daily activities. I want to be productive and effective but I also want to make sure I'm more open to life's daily blessings, big or small. I never want to miss out because my schedule is too rigid. For anyone who hasn't entered our $50 Stationery Giveaway from Pear Tree Greetings yet, click on the link, there's still time. Thank you to those who have already participated. Let me start off by saying that I never watch an Oprah show while it's airing at 4pm. I had turned the tv on this afternoon to make sure Sarah's House on HGTV was going to be recorded this Saturday via my DVR. When the tv came on Oprah's show had begun and it really intrigued me. She had a special Author guest Geneen Roth with a wonderful new book. I believe that this book has the ability to single handedly change the mindset that a lot of women are experiencing as it pertains to weight. Whether it's a battle with 100lbs or 10lbs, it's not the food that is the problem. It goes much deeper than that. You may have heard that concept before but I believe this book is dramatically different. 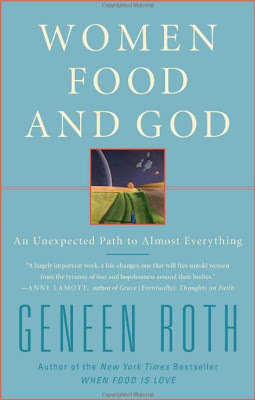 Despite this post's title which is actually Geneen's book title, the book doesn't focus on God in the religious way that you might think. It is all about our inner longing for something greater, in causes us to look into our past to better understand how we can move forward and love ourselves as women, and so much more. While doing the interview, Oprah was brought to tears because after many years of struggling with her weight and not really knowing what the deeper issue was, she was finally able to have one of her famous 'aha' moments and did not hold back from sharing it with the women of the world. She was able to pinpoint the exact time and belief from her childhood that she has channeled and let hold her back, it has prevented her from becoming the very best self that she has always dreamed of. Once again, just one reason why I view Oprah as the classy woman that she truly is. She doesn't proclaim to be perfect, with all of the world's celebration of her and her life achievements, even she was stumped as to what was holding her back from loving herself completely for so many yeas and from losing weight for good. That was until she read this book. All of us as women want to be and feel beautiful, lovely, loved, desired, important, special, meaningful and the best version of ourselves. It's been a harder road for some than others. Many don't love themselves or see theselves as the beautiful women that they truly are because of a number on a scale or the size of their thighs. What's worse is that many women have passed on the same self-loathing to their daughters (and in some cases their sons too) without even realizing it. While it's true that father's play an important role and this can be passed down from them, it is generally women that are guilty of beating themselves up on an almost daily basis in the pursuit of achieving their ideal image of beautiful and thin in their mind. The biggest message in this book is about loving yourself and kindness. Be kind to yourself. Look into your soul and feel who you truly are, not your mistakes, past disappointments or failures. One of the deep messages in this book was about feeling. We've all heard about how many alcoholics or drug addicts numb the pain of their current situation or past with these bandaids. 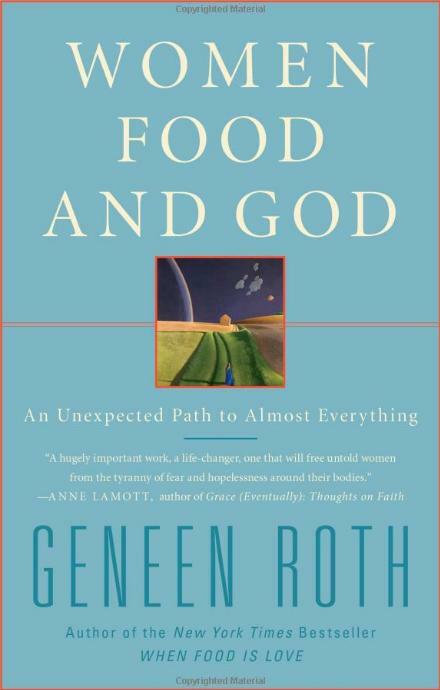 Have you thought about your relationship with food? Many eat because they are bored, overwhelmed, in pain or worse-want to prevent actually feeling any pain at all. The feelings and pain that aren't experienced get buried for a while but actually double as the food attempts to cover it all up. 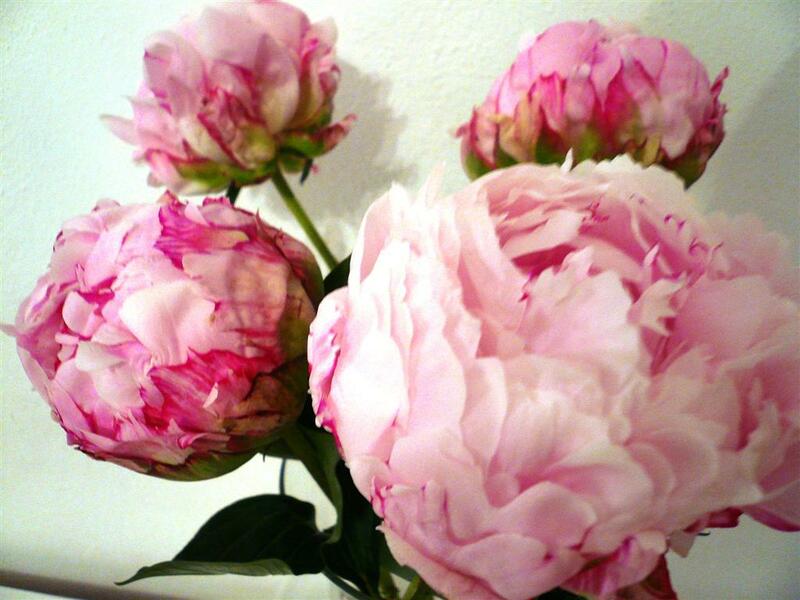 Then not only is pain felt but so is dissatisfaction with one's self. On a personal note, while I can't personally attest to having had a lifelong battle with weight or food; I will say that I have fallen into the category of eating when bored, overwhelmed or diving into a chocolate bar to temporarily de-stress from a crazy day. Like most women I have beaten myself up about a few pounds here or there from time to time. In my early twenties I did some modeling, an industry notorious for telling women that they are not good enough, thin enough for runway, not edgy enough for editorials, not pretty enough for commercial shoots, etc. During those three years I experienced a lot of highs and lows after every go see, audition and job. In some ways it changed the way I saw myself at that time. While the photo shoots were a lot of fun and the money was really lucrative at times, I chose to move on and leave that world behind which I knew was in my best interest. Since I had started later in life, I was at least wise enough to know what was good for me and healthy and what just contributed negatively in some ways to my life. If you get a chance to watch the later airing tonight of this show "Why Oprah says she'll Never Diet Again! ", I highly encourage you to watch it or program it into your DVR. That link includes the page on Oprah's site which provides more information. Here is the link to the book, at just $12.99 on amazon I think it is a great investment that every woman struggling in this area should consider buying for themselves or even their daughters. The purpose of life it to grow, love, renew ourselves and completely understand all that we were intended to be. P.S. Don't forget to enter our $50 Stationery Giveaway from Pear Tree Greetings! I hope all of you Mom's out there are celebrating in style today and having some fun. Sometimes the best gift is just a day to relax and not be needed by anyone. Spa days rank pretty high up there on the relaxation list. If my mom and I lived in the same country and were able to celebrate the day together that is what we'd be doing today. I came across this image yesterday and had to share. It's so spring-y, vibrant and pretty. What a fun color combination for an outdoor party, wedding, sweet sixteen celebration or an afternoon brunch with familly or friends. I love all of the elements down to the spray painted green chairs. Gorgeous! photo-Unknown. I found it and then couldn't remember where it came from. Stylish Stationery GIVEAWAY from Pear Tree! In honor of Mother's Day this weekend and my love for personalized stationery, Pear Tree Greetings has generously offered to give 1 lucky Classy & Fabulous reader a $50 gift certificate to purchase whatever they like in their online stationery store!! 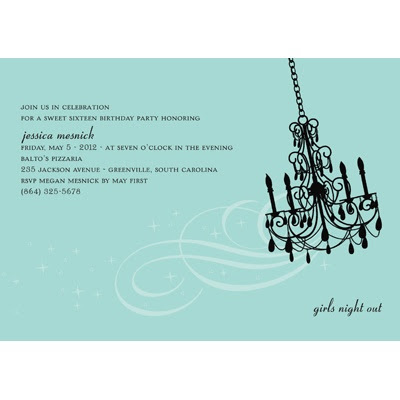 Pear Tree Greetings is a fun, fresh and affordable personalized stationery company that offers birth announcements, kid birthday invitations, note cards, address labels, save the date cards and much more! What's the best piece of advice your mom gave you growing up? 4. (3) entries for blogging about this giveaway with a link back to this post. There you have it, 7 ways to win this awesome prize! GIVEAWAY CLOSES: Saturday, May.22nd at 10pm EST. 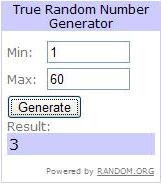 RULES: The winner will be selected using random.org and announced on 05/24. If you missed my related Reader Request on Stationery Savvy or my post titled Cards are Classy, you can view them now by clicking on the links. I hope you have a wonderful Mother's Day weekend & Good Luck! It is said that beauty is in the the eye of the beholder. When you look in the mirror every morning do you feel beautiful? 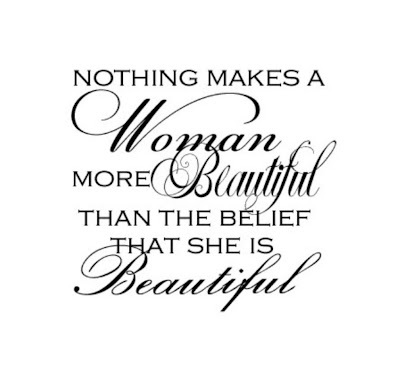 How a woman feels about herself truly determines how she carries herself, respects herself and treats others. It is not something that can always be seen in a woman's outer appearance or specifically put into words, it radiates from within. I love this quote below by Sophia Loren, it is so accurately stated. The belief of who we are is so much more powerful than what others think of us or tell us we are, or are not. If you haven't had a chance to read my previous post on the Price of Beauty, be sure to check it out. Named after Jessica Simpson's VH1 show I share one of the women whom she meets and what she was willing to do all in the name of outer beauty. Several months ago I set up a Twitter account and one of the people I added to my following list was Bethenny Frankel. You might recognize her name as she is one of the Reality tv personalities for the show 'Real Housewives of New York' on Bravo as well as a Natural Food Chef and Author. In her TV life, she is sarcastic, witty, funny and as she even admits, sometimes a bit bold and in-your-face when confronted with nonsense and drama. In her non-tv life though she appears to be a genuine and caring person who truly wants to help and uplift others with her books, healthy cooking and diet tips and is very diligent about responding to reader questions via twitter, which is why I follow her tweets. I like personable people that make time for others and don't let fame go to their head. I'm a nobody from NH, but I'm 43 yr old mom of 3 & have the very best thoughts for u right now. Good luck. We were all put on this earth for a reason. We all have a unique purpose to fulfill, our own sense of humor to share with others, gifts, talents, and abilities to explore and put to good use. None of us are less than another because we are not a household name, featured in the weekly tabloids or making millions from being in the public eye. Many female 'celebrities' are famous simply for being famous and countless others are in the spotlight on an almost daily basis for all the wrong reasons. It's not the kind of legacy I would ever want to leave behind. Remember the many facets of who you are. For many of us this includes being a mother, wife, daughter, sister, friend, aunt, niece, cousin, colleague, team mate, step-mother, teacher, blogger, activist and the list goes on. I can assure you that you are a somebody to many people in your life, even if you don't quite feel it. Be confident in who you are and be the very best possible version of yourself that you can be and above all be nice to yourself, love yourself. If you don't, nobody else can.